This will tell CocoaPods to download the Lookback framework, which you can then use from your code. P.S. We previously had both a "HD" and "Safe" version of the SDK. HD is no longer available, and only the appstore-safe version of Lookback is available. It is called just "Lookback", and "LookbackSafe" is no more. An Xcode Workspace file will be generated. 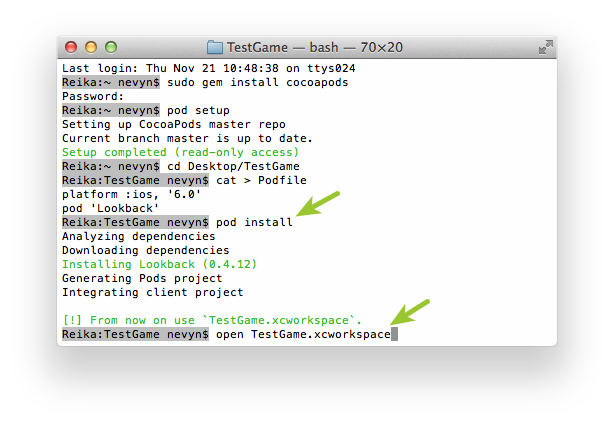 Open the workspace file – it’s named after your project, ending with .xcworkspace. If you're using Swift, you need to import Lookback from your bridging header before you can start using the Lookback APIs. If you don't already have a bridging header in your Xcode project, just create an Objective-C file in your project, and Xcode will ask you if it should create one for you. Once the bridging header is created, you can just delete the new Objective-C class. Awesome work so far 👍. Next, it's time to configure Lookback Participate!